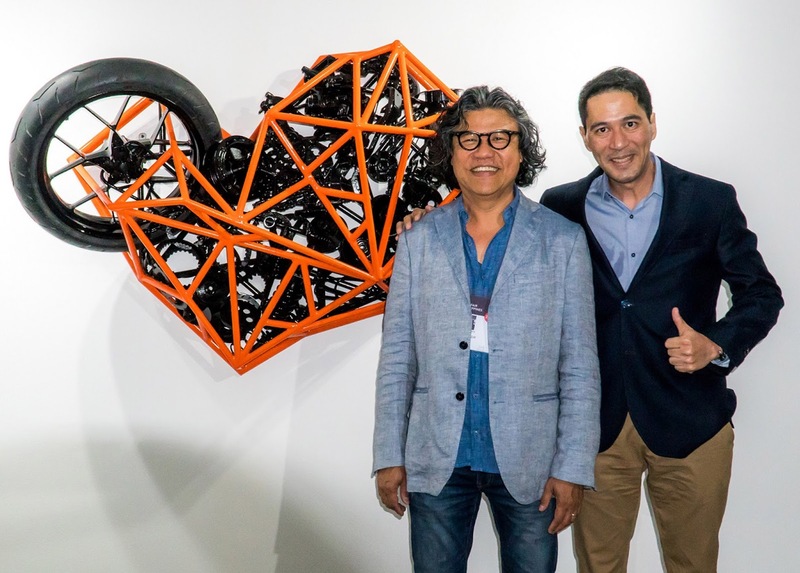 KTM Philippines presented the country’s motorcycle architectural landscape through various art pieces during the recent Art Fair Philippines 2018 at The Link, Ayala Center, Makati City. Maker of country’s high-performance and ready-to-race motorcycles, KTM stood as one of the prominent exhibitors during the four-day event. KTM commissioned celebrated sculptor Pete Jimenez, who “transforms a hard intractable material like iron into sculptural statements of wit and whimsy, mirth and merriment” and who has had over 16 solo exhibitions, to use KTM motorcycles as the inspiration for his pieces. Jimenez is among the few Filipino sculptors who have consistently explored the use of scrap iron as a medium. The KTM inspired collaboration resulted in an iconic orange frame of KTM bikes, pounded to form a heart, with motorcycle parts encased within, which the artist dubbed as “Racing Heart”. The striking artwork is Jimenez’s visual gem of a pun, showcasing wit and artistic skill. The extraordinary participation of a motorcycle brand in the art fair was described as re-imaginations of contemporary motorcycle architecture by rendering and defining the “melding point” of science, art, machine, humanity and technology. The platform exhibited the best in modern and contemporary Philippine visual art.